Can a golf tee help you hit longer and straighter drives? My guess is no but I am going to find out. Last summer at the inaugural Honolulu Open (2017) one of the gifts I received were the TRUETEE golf tees. They were not the only thing we received but they were the most golfy thing. You cannot look past how they are packaged in a cassette tape holder. What is this the 80’s? If I remember correctly I used the tee once or twice that day but that’s it. I was just grabbing any old tee and giving it a go. This is a two-man best ball tournament with 50+ dudes I’ve played softball with or against for the past decade. You may start to forget your golfing around the 7th hole which is what makes this tournament truly special. This years Honolulu Open (2018) was the first Saturday after the 4th of July and we received the TRUETEE’s again. I don’t remember what I did with last years but I decided I was not going to forget about them this year and test them out over a round of 18 holes just like how I do with golf balls. I immediately tucked them into my golf bag and didn’t bring them out to play once. Didn’t want to lose or forget about them. And here we are. Review time. 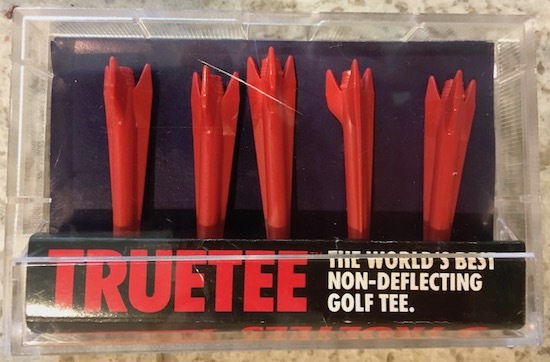 TRUETEE says their golf tee is “The World’s Best Non-Deflecting Golf Tee”. They did not provide any information saying how they earned that distinction so lets just believe that them and the other golf tee companies recreated the street fight scene from Anchorman. Last company standing wins. 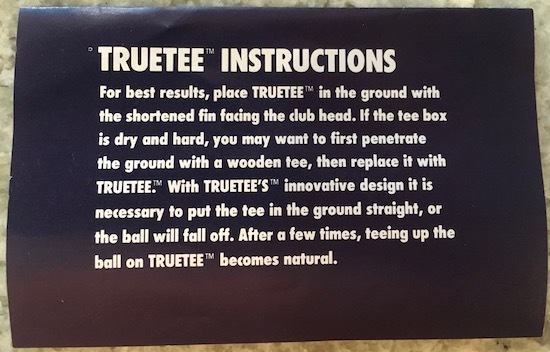 A first for me with a golf tee is that the TRUETEE comes with instructions. So I need to bring another golf tee with me to penetrate the ground under hard and dry conditions? 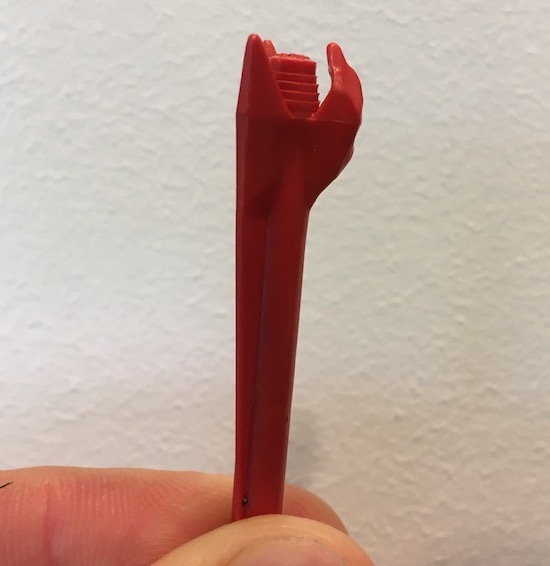 What, the TRUETEE can’t penetrate on its own? What’s most important is the shortest of the three fins has to be facing the club head. Outside of keeping it perfectly straight up to allow the golf ball to sit on it I now feel properly trained. Ok, so lets get into it. 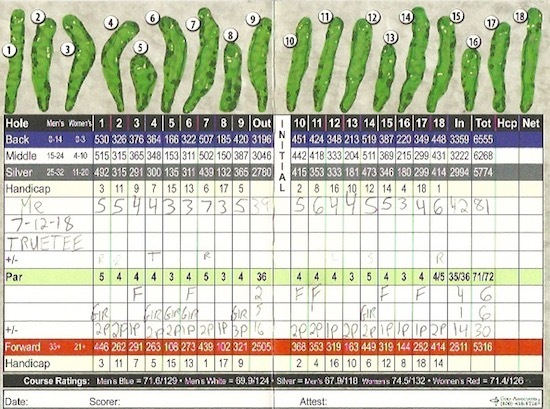 I played one 18 Hole round at Rackham Golf Course in Huntington Woods, MI. Temps were in the low 80s. A light breeze. Sunny. I used the TRUETEE on every single tee shot including hitting irons into the Par 3’s. To be as fair as I could with the TRUETEE I played a brand new Titleist PRO V1. 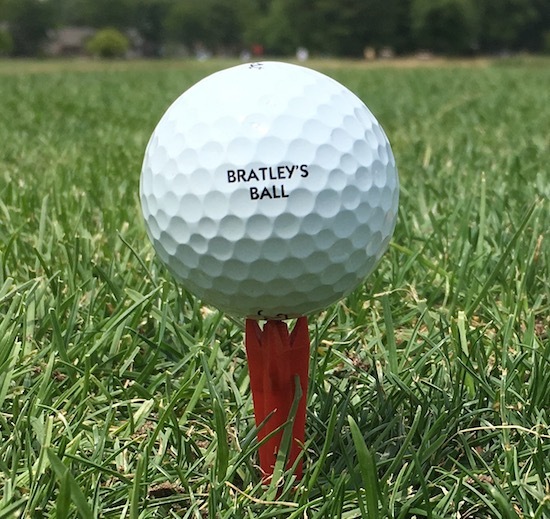 Its my go to golf ball, one I’ve expertly reviewed, and have played over 20 times at Rackham. I know where I end up on most drives with good old fashion wooden tees and a PRO V1 so I’ll have something to compare. I can assure you its a Pro V1. 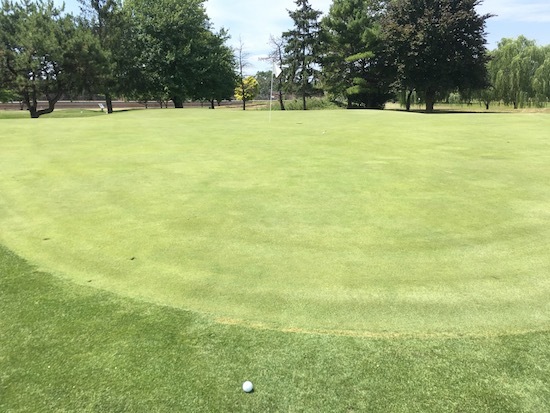 1st Hole – Pushed it way right. 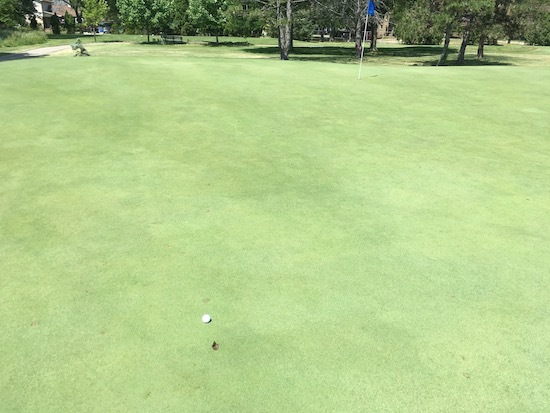 2nd Hole – I forgot to take a picture. My bad. It went right of the fairway. 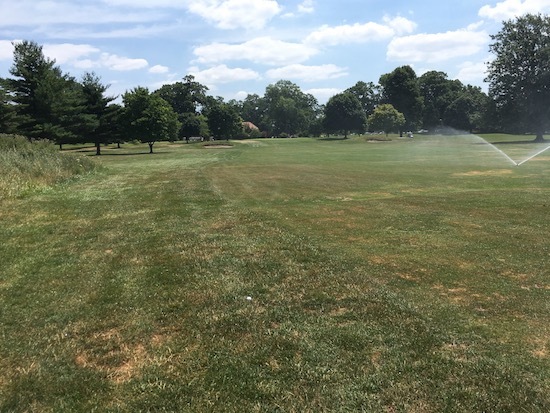 3rd Hole – Made it to the middle of the fairway and to the turn on this left dogleg. 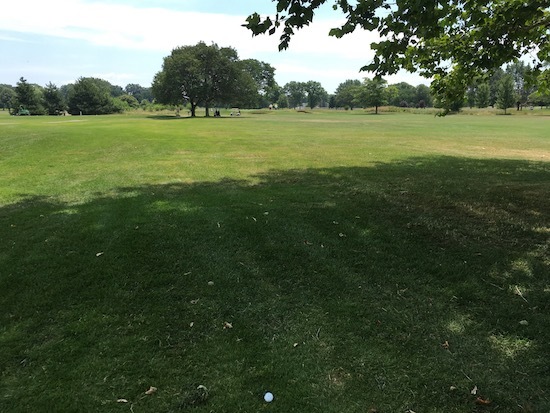 4th Hole – Hit it straight and through the fairway on this right dogleg. This has happened before and I should probably hit 3 wood. But I like to send it with driver. 5th Hole – A Green In Regulation on this Par 3. Hit 7 Iron. 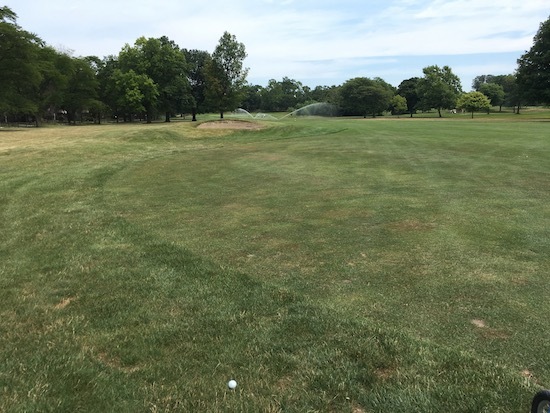 6th Hole – Made the bend and put it in the middle of the fairway on this subtle dogleg left Par 4. 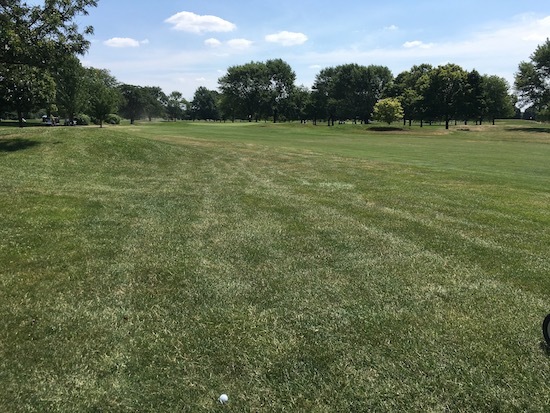 7th Hole – Forgot to take a picture. It went right…into a bunch of trees…and some tall grass. I should have taken a picture. It was scenic. You would have loved it. I got a 7 on this Par 5. 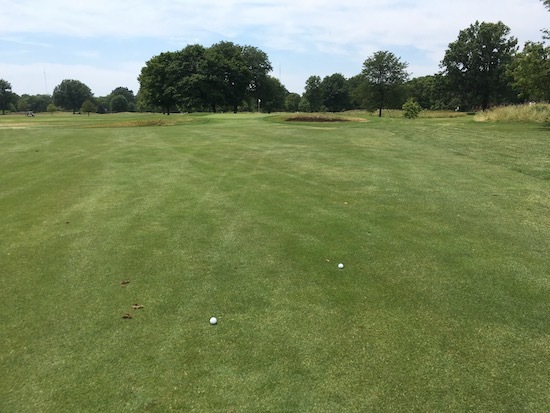 8th Hole – Hit 8 iron into this Par 3 and it backspun off the green. So sad. 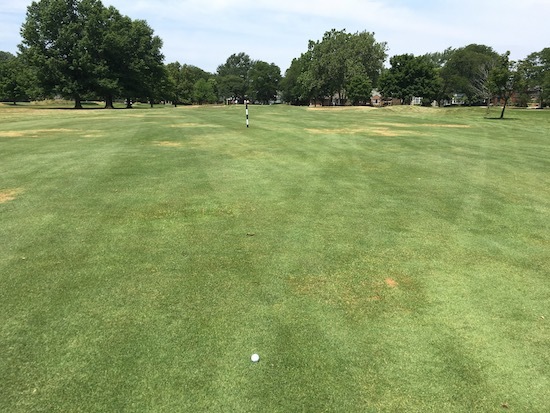 9th Hole – Hit it just through the left side of this offset fairway. 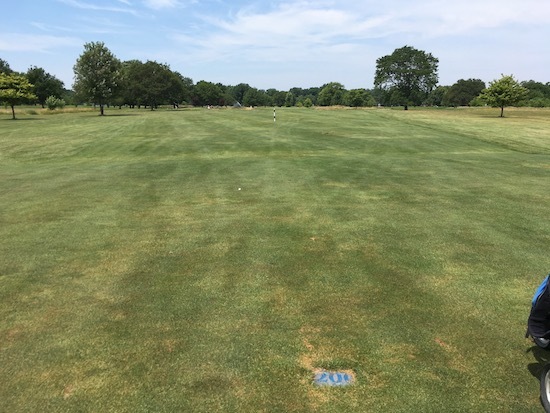 Tees are a good 25 yards right of the fairway. This is a good place to miss. 10th Hole – Right down the middle on this long Par 4. Anything past the 200 yard marker is an excellent drive if you ask me. This is a bit further than my previous longest drive I had two weeks prior with the Bandit SB. 11th Hole – Right down the middle on this also very long Par 4. 12th Hole – Way left. A dead pull. It was nice being in the shade for a second. 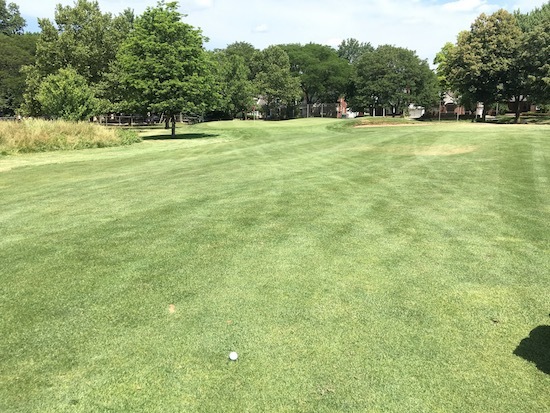 13th Hole – Forgot to take a picture on this long Par 3. My bad. Ended up left of the green. 14th Hole – Took the direct route to the fairway as the tee box is a good 20 yards left of the middle of the fairway. Didn’t make the fairway but this is a good drive. 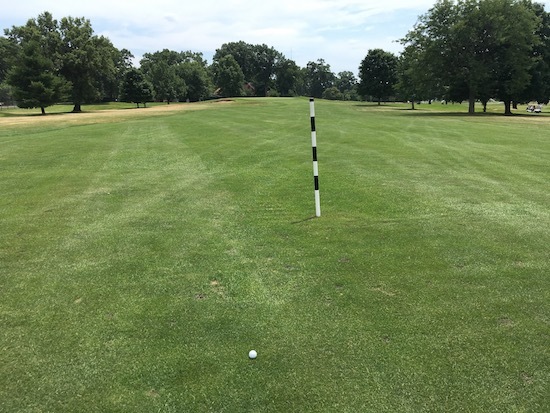 15th Hole – Anytime you end up near the 150 yard marker in the middle of the fairway on this deceivingly long Par 4 means you hit a super most premium excellent drive. 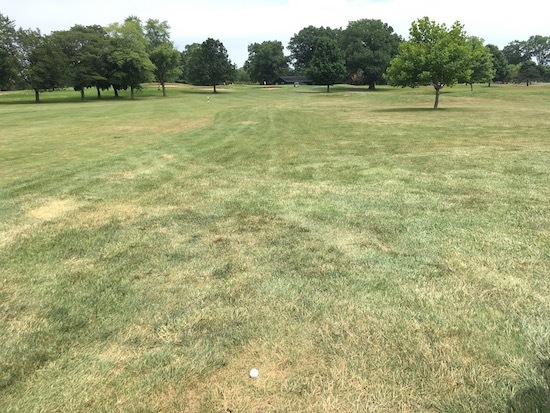 16th Hole – Forgot to take a picture of this very long Par 3. Ended up right of the green. 17th Hole – Right in the middle of the fairway about 60 yards from the green. One of those is mine. The other one is the dude I was golfing with second shot. He did not have a good first or second shot for that matter. 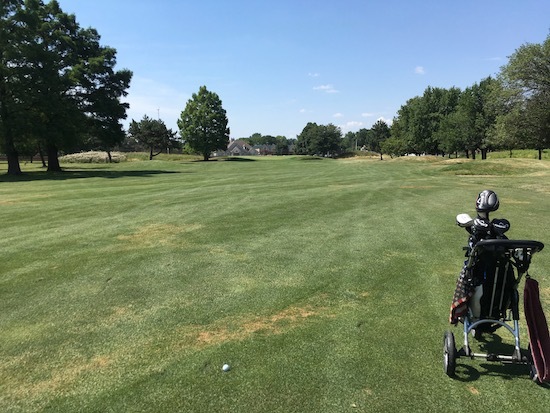 18th Hole – And to end the day I pushed it right. My stats say I hit 6 fairways and put 1 (out of 3) Par 3 tee shots on the green. Let’s give the TRUETEE a made up score of 7 out of 18. Let’s say a score of 7 is “regular”. And it was within mere yards of picking up a few extra points as some drives were just off the fairway or green. I really only had one bad drive (#7) that put me into a spot where I had to punch out. Do I think the TRUETEE helped me hit straighter drives compared to a regular wood tee? Not really. 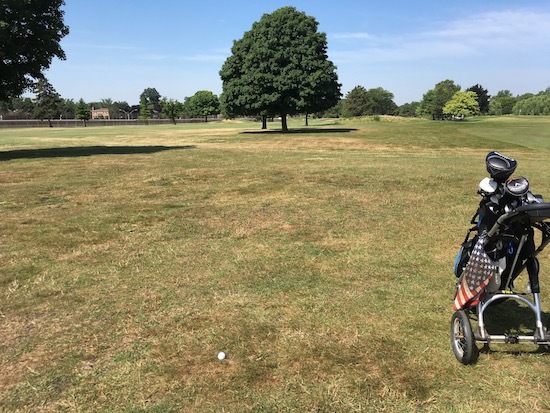 Do I think the TRUETEE helped me hit longer drives? Not really either. It did appear to have less friction at contact on some shots. And hitting irons into the Par 3’s seemed to launch it higher with more spin. But other than that I do not feel the TRUETEE gave me an advantage. I was ending up in a lot of the same spots I end up in whether I hit it well or missed it. Outside of my booming drive on #10 most of my drives were going the same distance too. It was a little annoying having to make sure the fins were lined up correctly and pointed in the right direction. And I did bend the all important short fin which made it unusable. I looked like quite the idiot trying to get the ball to sit until I figured out it was bent. TRUETEE made it 14 holes before I had to use another one. Don’t worry, I brought it home and threw it into our recycling bin. 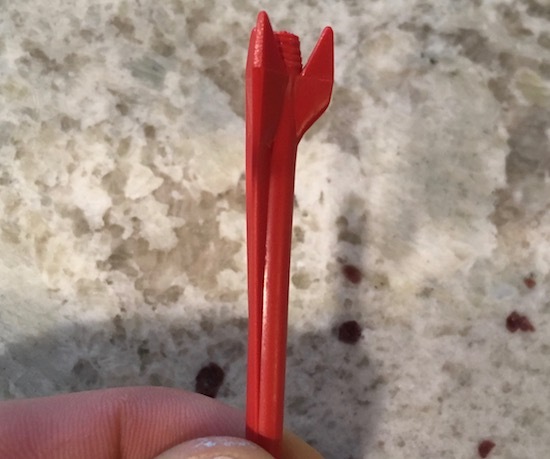 Its what happens to golf tees when you crush drives. Like, a lot. The one thing I did like was the height. The TRUETEE is not that tall so as soon as you get it into the ground its ready. There are no mis-hits due to teeing it too high. I shot an 81 which is a score I seem to put up a lot with a Titleist Pro V1. So it didn’t help me out on the score front. Outside of its unique packaging, design, and instructions I would not go out of my way to buy the TRUETEE. I’ll stick with whatever unbroken tee I find laying on the tee boxes that people leave behind. What’s funny is you can’t even buy them online. The company does not have a website. You have to fill out an order form that is on the back of the instructions or call an 800 number to get them. How hilarious is that? The only thing I could find about the TRUETEE online is a trademark submitted in 1986. I do not know how my buddy found them. They aren’t a bad golf tee and when he gives them out again next year I’ll throw them in the bag. I have no problem playing them at all. 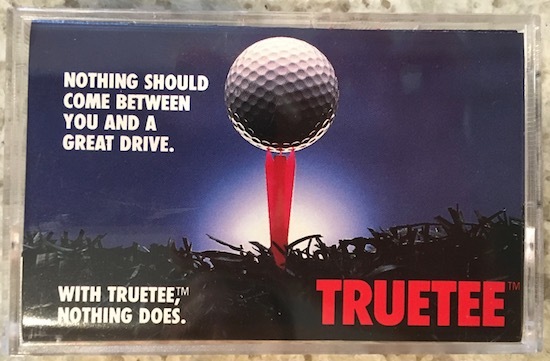 In the end I would keep your expectations on the low side if you happen to come across a TRUETEE and think its going to help you hit longer and straighter drives.